Comes in Silver and Brass. And at just $8, you seriously can't go wrong! To purchase, Clickity Click Here. Haha, I just bought your House of Harlow necklace last night on Ebay because I decided I couldn't live without it. Meghan: Good, I really hope you wear it and enjoy it as much as I wear mine! It goes with everything, trust me! I just saw this necklace on Lulus website yesterday and was thinking about purchasing it. I didn't look to see if they mention the lenght of it, so I'll check it out now :) It's super cute. Lilly: The chain length is 23 inches long for reference ;) My necklace is adjustable, but I personally love to wear it short so the little key hangs right around my neck. 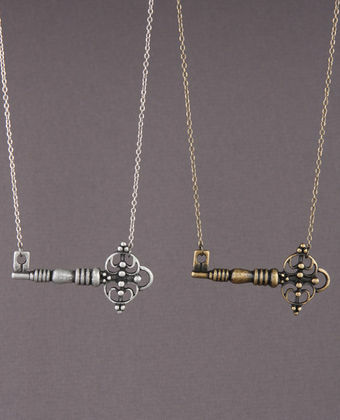 I <3 key necklaces! I already have too many but these are so unique! This is really cute! I've never ordered from lulu's but check out their new arrivals almost every day! Need to place an order soon! SO cute! I love key necklaces too. 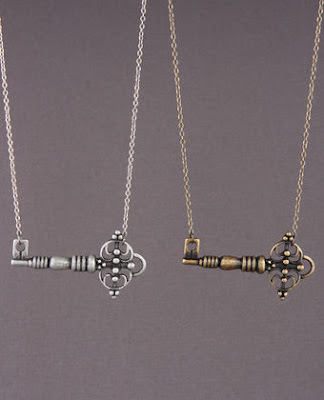 I think its funny because with these key necklaces its so hard to tell the different between one that is $$ and a cheapie! TaylorCristen: I hope she takes the hint! Kate: I have only ordered from Lulus once, but I was very happy with my purchase and the shipping was fast. Steph: I know, I totally agree! The only difference is mine is gold plated, but otherwise they are really identical!